This was an interesting exercise. It was my first time generating a poster to be delivered at a conference since 2006. Scientific communication has evolved a lot in the intervening decade, which spans a full half of my research career to date. So I had a chance to take the principles that I say that I admire and try to put them into practice. It helped that I wasn’t working alone. Jann and Brian both provided strong, simple images to help tell the story, and Mike and I were batting ideas back and forth, deciding on what we could safely leave out of our posters. Abstracts were the first to go, literature cited and acknowledgments were next. We both had the ambition of cutting the text down to just figure captions. Mike nailed that goal, but my poster ended up being slightly more narrative. I’m cool with that – it’s hardly text-heavy, especially compared with most of my efforts from back when. Check out the text-zilla I presented at SVP back in 2006, which is available on FigShare here. I am happier to see, looking back, that I’d done an almost purely image-and-caption poster, with no abstract and no lit cited, as early as 1999, with Kent Sanders as coauthor and primary art-generator – that one is also on FigShare. I took 8.5×11 color printouts of both my poster and Mike’s, and we ended up passing out most of them to people as we had conversations about our work. That turned out to be extremely useful – I had a 30-minute conversation about my poster at a coffee break the day before the posters even went up, precisely because I had a copy of it to hand to someone else. Like Mike, I found that presenting a poster resulted in more and better conversations than giving a talk. And it was the most personally relaxing SVPCA I’ve ever been to, because I wasn’t staying up late every night finishing or practicing my talk. I have a lot of stuff to say about the conference, the field trip, the citability of abstracts and posters (TL;DR: I’m for it), and so on, but unfortunately no time right now. I’m just popping in to get this posted while it’s still fresh. Like Mike’s poster, this one is now published alongside my team’s abstract on PeerJ PrePrints. I will hopefully have much more to say about the content in the future. This is a project that Jann, Brian, and I first dreamed up over a decade ago, when we were grad students at Berkeley. Mike provided the impetus for us to get it moving again, and kindly stepped aside when I basically hijacked his related but somewhat different take on ontogeny and serial homology. When my fall teaching is over, I’m hoping that the four of us can take all of this, along with additional examples found by Mike that didn’t make it into this presentation, and shape it into a manuscript. I’ll keep you posted on that. In the meantime, the comment field is open. For some related, previously-published posts, see this one for the baby sauropod verts, this one for CM 555, and this one for Plateosaurus. 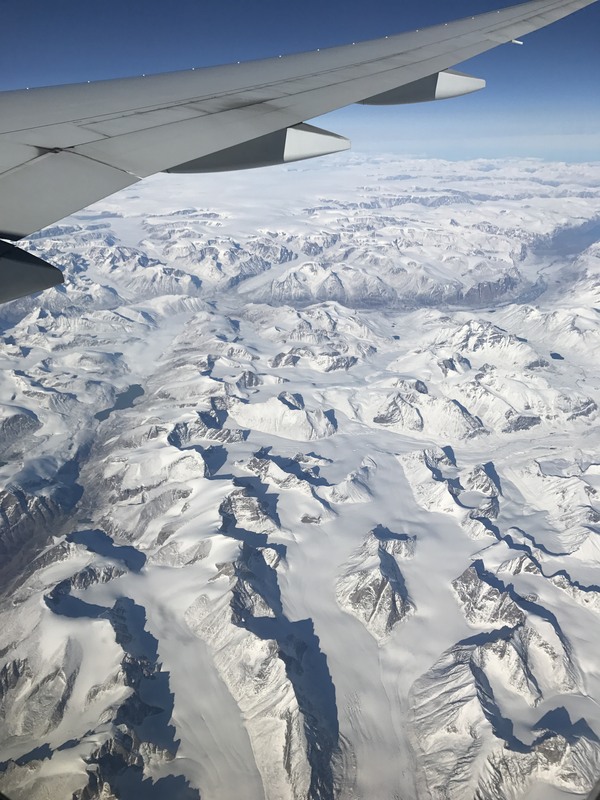 Flying over Baffin Island on the way home. And finally, since I didn’t put them into the poster itself, below are the full bibliographic references. 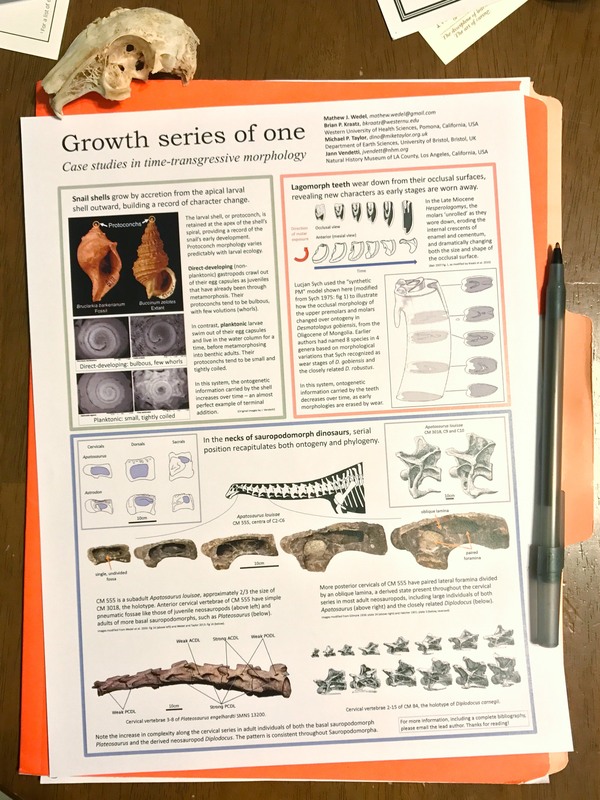 Although we didn’t mention it in the poster, the shell apex theory for inferring the larval habits of snails was first articulated by G. Thorson in 1950, which is referenced in full here. Bair, A.R. 2007. A model of wear in curved mammal teeth: controls on occlusal morphology and the evolution of hypsodonty in lagomorphs. Paleobiology 33(1):53-75. Kraatz, B.P., Meng, J., Weksler, M. and Li, C. 2010. Evolutionary patterns in the dentition of Duplicidentata (Mammalia) and a novel trend in the molarization of premolars. PloS one, 5(9), p.e12838. Sych, L. 1975. Lagomorpha from the Oligocene of Mongolia. Palaeontogia Polonica 33:183-200. Thorson, G. 1950. Reproductive and larval ecology of marine bottom invertebrates. Biological Reviews 25(1):1-45. Wedel, M.J., and Taylor, M.P. 2013. Neural spine bifurcation in sauropod dinosaurs of the Morrison Formation: ontogenetic and phylogenetic implications. Palarch’s Journal of Vertebrate Palaeontology 10(1):1-34. ISSN 1567-2158. Wedel, M.J., Cifelli, R.L., and Sanders, R.K. 2000b. Osteology, paleobiology, and relationships of the sauropod dinosaur Sauroposeidon. Acta Palaeontologica Polonica 45:343-388. Great poster; dense but readable as a poster. I didn’t quite follow the relevance of serial position of sauropod cervicals. 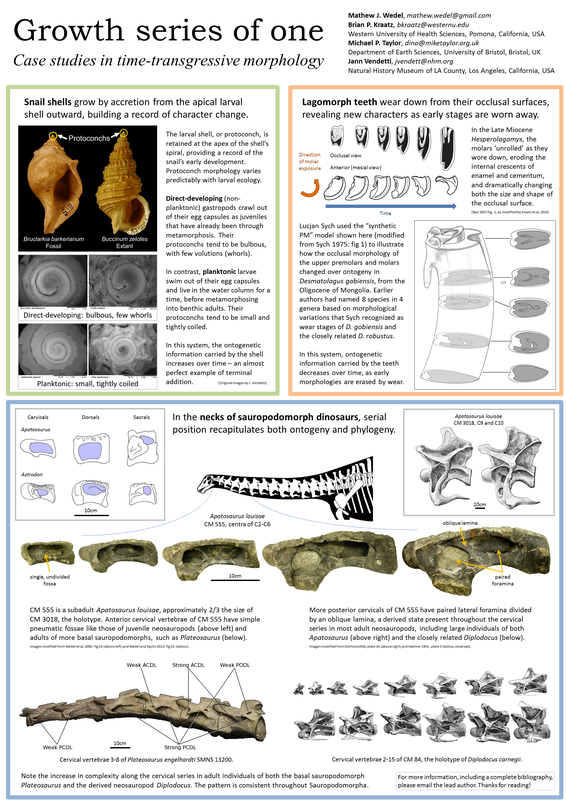 Is the poster saying the serial morphology of sauropod cervicals is connected to the time-transgressive morphology of snail shells and bunny teeth? Yep. The idea is that in all three cases, character states from multiple ontogenetic stages are represented in a single individual at one time. In the snail shell character states are added by accretion as the shell grows; in the lagomorph teeth ontogenetically later characters are revealed as early characters are worn away – but you can recover most or all of the stack by scanning or grinding a complete molar. The sauropod example is a bit more complicated. In young juveniles, all the vertebrae have simple, undivided, shallow fossae. In adults, all the cervicals except the atlas and maybe the axis have paired foramina that open into internal chambers. A subadult like CM 555 actually provides more information than either a young juvenile or an adult, because it has vertebrae at both endpoints of that transformation, as well some that record the intermediate steps. 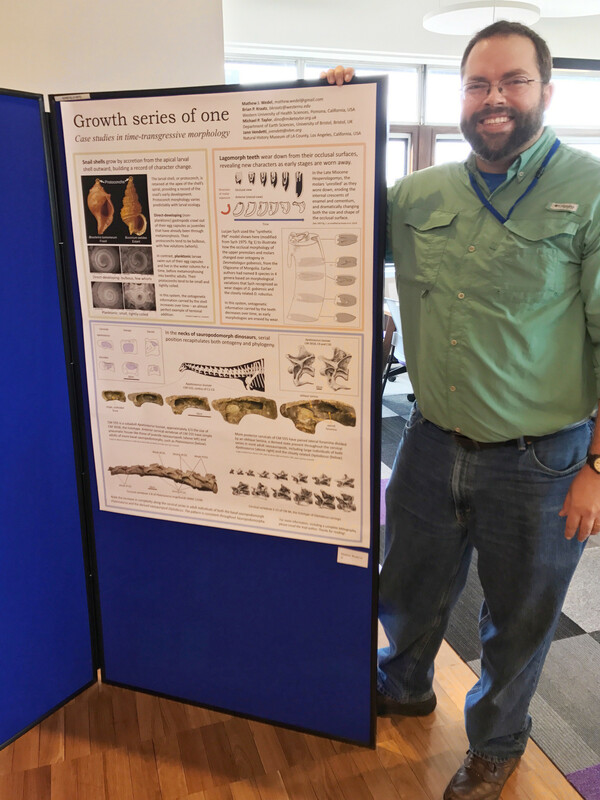 The analogy I used at the conference – but didn’t think of in time to include in the poster – is that all of the cervicals are on a developmental escalator from simple to complex, but they’re also on separate steps, with more posterior cervicals arriving at a derived, adult morphology first. The subadult CM 555 actually records more ontogenetic information than the adult CM 3018, because CM 3018 has lost the early character states – all of its cervicals have arrived at the top of the developmental escalator. ah; got it. very interesting. Presumably the more complex (i.e., posterior) cervicals take longer to develop, and subadults like CM 555 catch the process midstream to reveal the developmental escalator that adults like CM 3018 hide. Sounds like a win for CM 555. So much for bigger being better. Yes, you got it exactly. I think it’s super-interesting that for the first part of their lives, the sauropods are like the snails, adding character states, but then from subadulthood into maturity, they’re losing character states, like the lagomorphs. And it’s weird and cool to think of maturation involving a loss of information. Bones fusing over time may similarly hide info? And if we rewind the clock even more, it seems like a lot gets lost if we can’t watch the embryo grow through its weird intermediate stages. But that’s getting pretty far astray. Going back to the poster format, a nice benefit is its ability to speak on its own. Not just in handouts, but also in this blog. I suspect I’d have gotten a lot less out of this had your posted a slide deck w/ some background. Very interesting. I can definitely see some of the applications of this framework for studying less well-represented dinosaur faunas. The more phylogenetic and ontogenetic information we can squeeze out of subadult specimens (I’m looking at you, RMM 6670), the better!